Easily buy and print USPS postage stamps online for letter mailings. To buy postage stamps online, all you need is a printer, approved postage labels and a subscription to a PC Postage service such as Stamps.com. Stamps.com, the leader in online postage with over 732,000 customers, offers the ability to buy and print postage stamps using special labels called NetStamps. These adhesive labels can be used to send any class of mail for domestic or international letters. 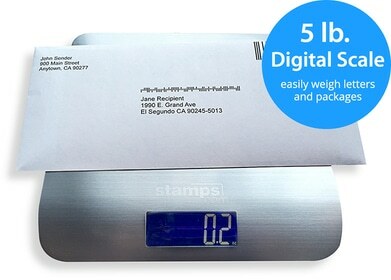 Postage for NetStamps can be printed using a regular inkjet or laser printer. Try us out for 4 weeks! Get $5 free postage to use during your trial. Try us out for 4 weeks! Get $5 free postage to use during your trial. Try us out for 4 weeks! Get $5 free postage (to use during your trial). Choose whether you want to specify the postage value for each stamp, or let Stamps.com calculate the amount of postage you need. Select a domestic or international mail class. Enter the desired postage value (up to $200), or click the “Intl” button to calculate rates for International mail. Enter the weight of the mailpiece. Select your desired domestic mail class. If necessary, enter package dimensions and/or destination ZIP (required for Priority Mail or Priority Mail Express). Optionally, purchase USPS Special Services, by clicking the “Select…” button. Enter the NetStamps sheet Serial Number, such as B12345, in the designated serial number field. Specify the number of NetStamps labels you want to print. You can print any number of stamps you choose or print the entire page of postage stamps. Using the preview, verify that the labels to be printed are available to print on your NetStamps sheet. To change the starting label, simply click the label you want to start on. A sample print is strongly recommended the first time you print and each time you change your printer, printer settings, or print media. Place your NetStamps label sheet(s) into your printer and click the “Print Postage” button.